Description: The Sugar River runs alongside the park and is in play on a few holes. Be aware and be safe. 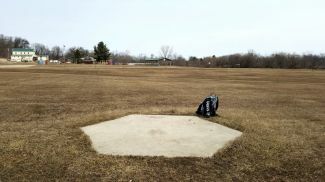 The disc golf course is in memory of our friend Zachary Gray Luchsinger. Local Directions: From Belleville, go south and east for approximately three miles on Hwy 92. Turn right (south) on Hwy D, and travel for approximately 650 feet. Park entrance is on the left side of the road. First tee on the right side of the driveway.